Do You Know How to Work in a Team? 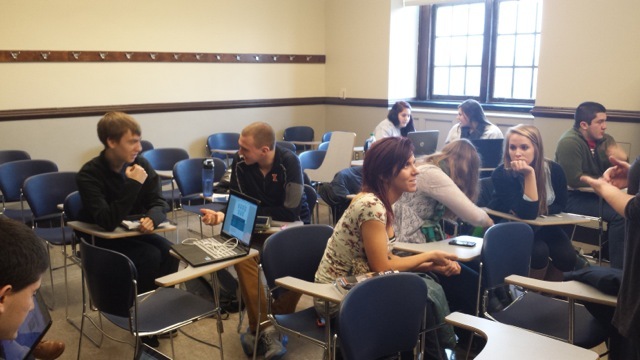 Business Spanish students at the University of Illinois have the professional experience of working in teams to provide social media marketing materials to organizations in the community. Students hear the word “teamwork” and often groan–some feel like they always bear more of the burden for the project than other team member, some dread the logistics of finding time to meet outside of class, and almost everyone feels like it’s a drain to spend so much time talking about who, what, when, where, why instead of just getting to work doing whatever it is that needs to get done. The problem is, teamwork is not unique to college–you will probably spend your entire career working collaboratively with others. But college is a great place to gain experience and practice with the kind of teamwork you will need in the workplace. What does it mean to work on a team? In an academic context or in a professional context, it should mean working collaboratively to ensure that the best possible product or service is delivered to the client. What teamwork too often winds up being in practice is an exercise in “divide and conquer:” person A is in charge of client communication, person B is in charge of spreadsheets, person C is in charge of raw data. While it’s always a good idea to divide the work according to the strengths (and weaknesses) of individual team members, that is never enough. Person A receives an email from the client, “please forward me the accounts receivable spreadsheet.” Person A contacts the team member in charge of spreadsheets, “please see forwarded email.” Person B (in charge of the spreadsheets), sends the accounts payable spreadsheet. Person A does not check the name of the spreadsheet and immediately forwards the wrong spreadsheet to the client. Why? Because Person A’s job is to communicate with the client and that person therefore has nothing whatsoever to do with spreadsheets. This is where the division of labor approach falls apart because the person whose job it was to communicate with the client just failed to do so successfully. Now the whole process has to start over and the client is probably confused and/or frustrated. This is where collaboration comes in–it is what allows each person to successfully execute their assigned parts. When you truly collaborate in a team, you are constantly checking each other’s work even when you have divided the responsibilities broadly according to each team member’s talents. In this example, Person A should communicate to the client the roles of each team member. When the request for the accounts receivable spreadsheet is received, an appropriate immediate response would be, “I will get that spreadsheet from Person B and get back to you as soon as possible.” The client is now in the loop on the division of labor and is in a better position to understand when the collaborative element breaks down–and therefore able to hold you responsible for the collaborative and individual aspects of your teamwork. Then when Person A receives the spreadsheet from Person B, she should immediately check that the spreadsheet is labeled “accounts receivable” and then at least scan the spreadsheet itself to make sure that the content matches the label. In this way, the division of labor holds, but checks are built into the process to make sure that the collaborative aspect of the project hasn’t broken down. Something similar should be going on with the data: before Person B puts data into the spreadsheet, he has to check that the data provided by Person C is correct and accurate. It would be a mistake to just blindly plug in numbers, especially when a quick glance can pick up data that is entirely out of whack. This is just one example of what it really means to work in teams in a professional context. It is always a delicate balance between working together and working individually. While working on the detailed aspects of the project that allow your individual strengths to shine, you are occasionally taking a step back to ensure that your work fits together well with that of the rest of the team. Successful teamwork requires you to constantly move back and forth between individual and group in such a way that achieves the best possible results. Image | This entry was posted in Career Advice. Bookmark the permalink. 2 Responses to Do You Know How to Work in a Team? Yes! You need to have trust among your team members, but you also need to know that every aspect of the team project reflects on every single team member.